Soy has been touted as a wonder food. We are told that soy can promote heart health, help prevent cancer, support bone health and alleviate menopausal symptoms. A protein-packed, low-fat food, soy has been consumed in Asia for thousands of years, in the form of soy milk and fermented tofu, miso and soy sauce. Walk down the frozen food aisle of your grocery store to find soy-based veggie burgers, tofu hot dogs, and vegetarian frozen dinners. Your grocery store has TVP (textured vegetable protein), powdered soy drinks, soy protein bars, soy cheese, and much more. You can even get soy milk in your latté Starbuck’s®! If you or your doctor suspect thyroid problems, lab work is needed and patients should get a yearly test. Thyroid problems run in families and if the mother has a thyroid problem, the daughter should get checked early on in life and regularly. Women, especially menopausal and pregnant women, need to be careful about soy consumption because they are 6 times more likely than men to suffer from thyroid problems. Hypothyroidism leads to decreased production of T3 & T4 hormones and an elevated level of TSH. 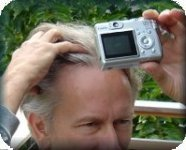 If hair loss occurs, it will not grow back regardless of your age, so early detection is important. A free lab work page is available online. Print it out and bring it to your general doctor for early detection. If you take a protein shake, you take a shake containing whey protein concentrate rather than a soy-based shake. Dr. Shapiro’s Help Hair™ Whey Protein Shake is soy free because of concerns about the risk of thyroid issues. The product has added iodine for essential thyroid function. This formula is whey based and has added amino acids, the building blocks for hair. Soybeans are deficient in sulfur-containing amino acids methionine and cystine, which are essential for healthy hair. As with all health claims, it’s “buyer beware.” Before adding a lot of soy into your diet, research the pros and cons for your gender, age and specific situation. 1. Doerge DR., et al. 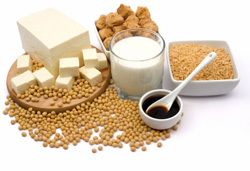 “Goitrogenic and Estrogenic Activity of Soy Isoflavones.” Environmental Health Perspectives. June 2002;110 Suppl 3:349-53. 2. Divi RL., et al. “Anti-thyroid isoflavones from soybean: isolation, characterization, and mechanisms of action.” Biochemical Pharmacology. 1997 Nov 15;54(10):1087-96. This entry was posted in Baldness, General, Hair Health, Hair Loss, Hair Loss in Women, Health - General on June 30, 2009 by Larry Shapiro.